Laurence Aloysius Dondanville, the ninth and youngest child of Wallace Dondanville and Elizabeth Sherman was born on the farm in Serena Township, LaSalle County, Illinois on July 7, 1892. Completing his grade school education he remained on the farm with his father until his older brother finished high school. In 1909 at the age of 16 he entered high school at St. Mary's College, St. Mary's, Kansas. At St. Mary's he participated in both basketball and football. He was an all conference end and captain of the football team his senior year. His team mates called him Don, a nickname that stuck with him throughout his life. Don graduated from St. Mary's in June 1913. He entered St. Viator's College in Bourbonnais, Illinois that year to pursue a course in premedicine. He played football at St. Viator's and, with classmate Bishop Fulton J. Sheen, was a member of the varsity debate team. He graduated from St. Viator's on June 14, 1917. Upon graduation he entered the United States Army Medical Department serving as a Sergeant 1st Class with the 276th Field Hospital Company at Fort Dodge, Iowa. He was discharged from the Army in 1919 and entered Northwestern University School of Medicine in Chicago. While in med school he lived with his brother, Father Ed, and commuted to the north side campus. He was a member of Phi Chi Medical Fraternity. Don graduated from Northwestern with a Doctor of Medicine Degree and was elected into Alpha Omega Alpha National Medical Honor Society in 1924. He was accepted as an intern at St. Joseph's Hospital in Chicago and served in a surgical residency at St. Joseph's in 1925-26 following his internship. In 1926 he entered into practice with his brother Martin in Moline, Illinois as a physician and surgeon. While at St. Joseph's Don met Eva Catherine Ender, the only child of North Ender of Chicago and Bertha Price of Greensburg, Indiana. Her parents had moved to Pasadena, California because of their health and Eva was born there. Following the early deaths of her parents she was raised by her grandparents in Deerfield, Illinois. She graduated from St. Mary's College in South Bend, Indiana and entered nurses training at St. Joseph's Hospital. She was employed there as a laboratory technician when she met Laurence some time in 1924-25. Laurence Aloysius Dondanville and Eva Catherine Ender were married in Holy Cross Church, Deerfield, Illinois on June 15, 1927. They established their home in Moline where five children were born to their marriage. Don practiced medicine in Moline for nearly 35 years. He was on the staff of Moline Public Hospital and St. Anthony's Hospital in Rock Island, Illinois and was Head of Staff at Moline Public in 1940. He was a Past President of the Rock Island County Medical Society and in 1955 was honored by the Society as the General Practitioner of the year. He succeeded his brother in 1948 as Division Surgeon for the Chicago, Rock Island and Pacific Railroad. He was a past Grand Knight of the Leo Council of the Knights of Columbus and was active in St. Mary's Church in Moline. Laurence Aloysius Dondanville died at home in Moline on November 14, 1960. Eva Ender Dondanville sold the home in Moline and resided in Davenport, Iowa for 30 years following his death. Eva died at The Kahl Home in Davenport on January 4, 1989. Both are buried in St. Mary's Cemetery, Highland Park, Illinois in the Ender family plot. 129.2 Catherine Elizabeth, January 4, 1930.
married Moline, Illinois 1953 to Thomas E. Fieweger Jr. ; three children, Thomas E. III 56, Catherine Ann 58, and Elizabeth Ender 61. 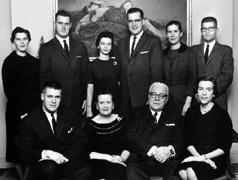 married Bettendorf, Iowa 1958 to Karen Marie Neu; five children, Elizabeth Ann 59; Louis William 60; Ann Marie 61; Joseph Laurence 67; and Paul Edward 69. married Chicago, Illinois 1966 to Maureen Catherine Ryan; two children, Edward John 68; and Julie Ann 72.